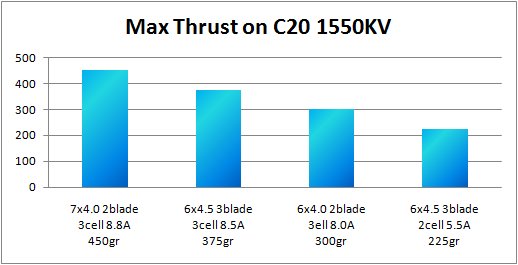 This first graph show the max thrust for several configurations of propellers and batteries. I made 3 configuration on a 3 cell lipo and 1 on a 2 cell lipo. As for myself the practical comparrison between 2blade and 3blade props was the most important. 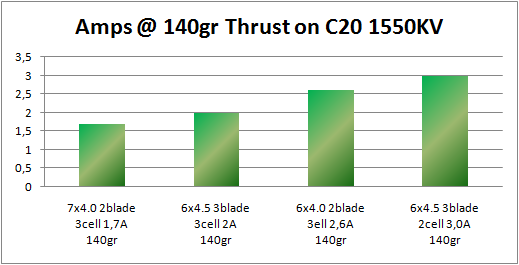 As you can see on the graph, a 6 inch TriBlade prop consumes the same as a 7 inch TwoBlade prop. The max thrust for the 6 inch 3blade prop is less then 7 inch 2blade prop, so the 6 inch TriBlade is less efficient. 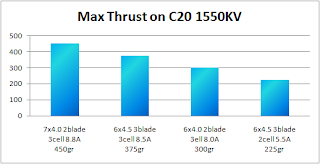 But if you look at thrust and amps compared with the 6 inch TwoBlade, we can conclude that the 6 inch TriBlade is more efficient. An other impartant value is to know the amps @ hover. If you know how much amps each motor consumes when hovering you can calculate an estimated flying time. For this project I'll not need more then 140gr of thrust per motor for hovering. As you can see again a 7 inch 2blade is more efficient then a 6 inch 3blade, but this last one is much more efficient then a 6inch 2blade. This project and the components I use where chosed to work with a 3cell battery. As the graphs show a 2cell battery should theoretically be enough for my setup. If my quad is ready I'll do a pratical test with a 2cell battery to verify if it is really flyable.